American mothers today look far different from mothers celebrated 100 years ago when President Woodrow Wilson issued a proclamation calling for a day of reverence for mothers. Here’s what we know about today’s American moms and how they’ve changed over time. There are about 85 million mothers in America, according to a recent U.S. Census Bureau estimate. Our analysis of census data shows that the share of mothers with kids younger than 18 at home has declined. Today, about a third (34%) of women ages 18-64 have young children at home; in 1960, 52% did. And women are having children at a later age than they used to. In 2012, the average age of a first-time mother was 25.8 years, up from 21.4 years in 1970. The marital status of mothers has also changed dramatically. 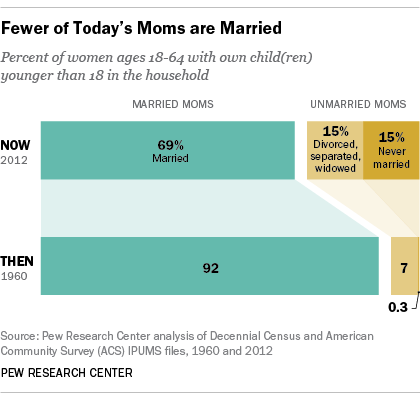 In 1960, nearly all mothers with young children were married, compared with just seven-in-ten today. About four-in-ten (41%) of all births today are to unmarried women; up from just 5% of births in 1960. 2How many kids do they have? The Census reports that among women ages 40 to 44 — who are near the end of their child-bearing years and likely to have already completed their lifetime fertility — one third has had two children, 19 percent have either had one or three and about 10% have had four or more. About one-in-five women (19%) in this age group has had no children. 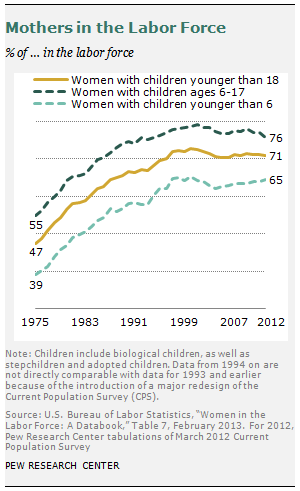 American mothers are now expected to have, on average, 1.9 children, compared with 3.7 children in 1960. But this number varies by race and ethnicity. The average for Hispanic mothers is 2.2 children over the course of their lifetime, compared with 1.9 for non-Hispanic black mothers, and 1.8 for Asian and non-Hispanic white mothers. 3How do moms spend their time? 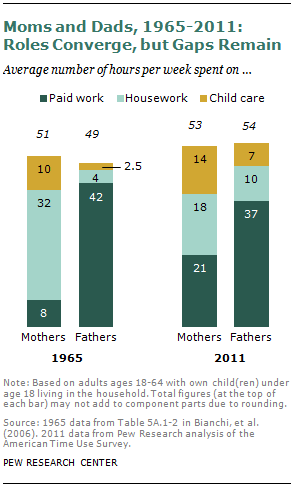 Today’s moms work more hours outside the home and spend far less time on housework than they did 50 years ago. They also spend more time with their children than mothers did in the 1960s, and about twice as much time as today’s fathers do. For their part, dads now spend more time on housework and child care than they used to, but they haven’t caught up to moms. When it comes to leisure time, fathers out-relax moms, spending 28 hours per week on leisure activities on average, compared with 25 hours for moms. The leisure gap between moms and dads is especially wide on the weekends. 4How many moms are working? About seven-in-ten mothers (71%) with children younger than 18 were in the labor force in 2012, compared with less than half (47%) in 1975. Meanwhile, after decades of decline, the share of stay-at-home moms has ticked up since 1999. More mothers are also now providing for their families. A record 40% of all households with children under the age of 18 include mothers who are either the sole or primary source of income for the family, up from just 11% in 1960. About two-thirds of these “breadwinner moms” are single mothers. When you ask mothers what their “ideal” working situation would be, most say they would rather work than stay at home, but they prefer part-time work over full-time. And half of all working moms with young kids say that being a working parent has made it harder for them to advance in their careers. Only 16% of working dads say the same. However, Americans have mixed views today about the ideal situation for children. A plurality of adults (42%) in 2012 say having a mother who works part time is ideal for a young child, and one-third say having a mother who doesn’t work at all is ideal. Only 16% say a mother who works full-time is the ideal. 5How do moms feel about the job they’re doing raising their kids? Despite spending more time with their kids than they did a generation ago, about a quarter of mothers (and half of fathers) say they do not spend enough time with their children. Even so, about three-quarters of moms give themselves high ratings on their parenting. Working mothers are particularly likely to give themselves a thumbs up.